One of the questions that we get asked most often is “Where do you get your jewelry?” There isn’t a simple answer, the truth is that sometimes the treasures find us and sometimes we find them. 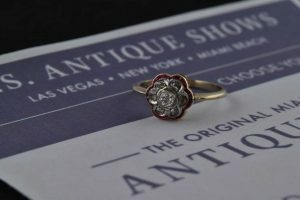 Last month, Joe went in search of some new baubles and bling at the Original Miami Beach Antique Show. We’ve been attending this show for more than thirty years. It’s an annual opportunity to add unique gems to our already spectacular collection. Upon his return, we are always excited to see all the things that Joe has brought with him. From a 14.00 carat diamond to this tiny ring, each one was “Oh So Joden”. This little ring was one of my favorite finds… and clearly one of Joe’s as well, considering it’s now in his Special Box. A scalloped flower was created utilizing seven rose cut diamonds. These diamonds are surrounded by a halo of fancy cut rubies, providing a much needed pop of color! It fits perfectly on any finger from the index to the pinky and is moderately priced at $1600. Visit us at Joden and see what other riches came home to Pennsylvania. We went to Miami to shop so you could come to Joden and touch.